Three tobacco companies have been ordered to pay $15 billion in damages after losing a historic court case. Judge Brian Riordan on Monday ruled in favour of two groups representing Quebec smokers, ordering Imperial Tobacco, Rothmans Benson & Hedges and JTI-MacDonald to pay for punitive and moral damages. “It’s a big day for victims of tobacco, who have been waiting for about 17 years for this decision. It was a long process — but arrived at the destination and it’s a big victory,” said Mario Bujold, executive director of the Quebec Council on Tobacco and Health. The legal proceedings began in March 2012, 13 years after two class-action lawsuits were initiated by groups comprising about one million people. The lawsuits, which sought $27 billion in damages, were heard together in what was touted as the biggest civil case in Canadian history. One suit, known as the Blais File, involves individuals who became seriously ill from smoking. The other, the Létourneau File, was launched by a group whose members say they are unable to quit smoking. Failed to properly warn their customers about the dangers of smoking. Underestimated evidence relating to the harmful effects of tobacco. The plaintiffs with cancer who began smoking before January 1976 will get $100,000 each. Those who first lit up after that date are entitled to $90,000. Those with emphysema will receive $30,000 in moral damages if they began smoking before Jan. 1, 1976, and $24,000 if they started smoking after that date. For the almost one million Quebec smokers who were unable to quit, the breakdown comes out to about $130 per person. “I am so relieved with what has happened,” Lise Blais, whose husband Jean-Yves Blais initiated one of the lawsuits, told a crowd at a news conference. “Did you stop to think what a cigarette is? It destroys you — your health is totally destroyed,” she said, holding up two photos of her late husband, who died in the summer of 2012 from lung cancer at the age of 68. “He would be very happy. He is a winner. He likes to win — the same as I do,” Blais said. “Seventeen years is long, but I had my hope that we were going to win — and we did,” Blais said. “They lied to everyone … but they didn’t just lie. They colluded to lie,” he said. JTI-Macdonald Corp. issued a statement minutes after the 4 p.m. ET ruling came down, saying it will appeal the judgment. “The company strongly believes that the evidence presented at trial does not justify the court’s conclusions,” the statement said. Imperial Tobacco Canada said it was extremely disappointed and will also challenge the ruling. “Today’s judgment ignores the reality that both adult consumers and governments have known about the risks associated with smoking for decades, and seeks to relieve adult consumers of any responsibility for their actions,” said Tamara Gitto, vice-president of Imperial Tobacco Canada. Gitto said a Gallup poll in 1963 confirmed that 96 per cent of Canadians were aware that smoking may cause lung cancer. Rothmans Benson & Hedges also announced it will appeal the Quebec Superior Court’s decision. In spite of an appeal, the judgment says that $1 billion must be paid out. “The Court orders the provisional execution of the judgment notwithstanding appeal with respect to the initial deposit of one billion dollars of moral damages, plus all punitive damages awarded,” said the 276-page ruling. 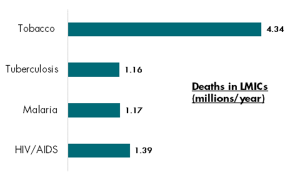 · First, while the WHO has sought to resist Big Tobacco, it seems that the focus of World No Tobacco Day is nonetheless a reflection of the lobby’s concerted efforts to shift policy attention away from measures that cut consumption (and death). · Second, the tobacco lobby benefits from the effective support – inadvertent or otherwise – of some major players (corporate and individual) in international tax, who should be taking a long, hard look at their role. ASH’s last legislative programme – 2008’s ‘Beyond Smoking Kills’ – became obsolete when the Conservatives acted on its wackiest idea, plain packaging, earlier in the year. Total victory set the stage for yet another brainstorming session, the fruits of which will be released in a report titled ‘Smoking Still Kills’ later this month. This document has already fallen into the hands of Guido Fawkes who provided a peek preview today. If smokers were hoping that the vendetta against them would end with plain packaging, they need to think again. Amongst ASH’s new ruses are minimum pricing for tobacco, annual price rises of five per cent above inflation for cigarettes, a smoking ban in all cars and a ban on smoking outdoors. In recent years, anti-smoking policies such as banning tobacco displays in shops have been put forward on the not-very-convincing pretext that they will discourage children from taking up the habit. Before that, the smoking ban in enclosed spaces was pushed on the basis that it would ‘protect’ employees. Drunk with success, ASH has now ditched such rhetoric. The new policies are overtly aimed at hassling and impoverishing adults who choose to smoke. When the smoking ban came in, anti-smoking campaigners swore on a stack of bibles that they would never consider banning smoking in the open air. They now want a consultation on it. When they lobbied for a ban on smoking in cars with children, they promised that it was not the start of a slippery slope that would lead to a ban in all cars. They are now pushing for exactly that. All this from a group that laughably claims that it is ‘not anti-smoker’. They even want to get rid of the trifling exemption to the smoking ban that allows actors to smoke in theatrical productions. Seriously, what do they hope to gain from such teeth-grinding fanaticism? Oh, and if you want to watch a film or TV show that portrays someone smoking, ASH think you should be subjected to a hectoring anti-smoking commercial beforehand. Compulsory by law, naturally. It would be easy to assume that this combination of petty and extreme demands are a way of ASH justifying their state funding at a time of budget cuts (ASH receives a generous grant from the Department of Health every year). Mission creep is nothing new in pressure group politics, but for organisations like ASH incremental prohibition has always been the game. Mission creep is a feature, not a bug, of ‘tobacco control’. ASH could never have achieved what they have if they had been open about their agenda when they were formed in the 1970s. Even today, they will not admit to being prohibitionists. They just want smoking to be sort-of-prohibited. The problem with treating smoking as if it is virtually illegal is that smokers start viewing it the same way. The sale of illegal cigarettes has risen by 33 per cent in the last two years, according to HMRC, and it is likely to rise further when branding is abolished next year. In its 2008 manifesto, ASH hoped that the illicit share of the cigarette market would be three per cent by 2015. In fact, it is 10 per cent and rising. That’s four billion cigarettes entering the country every year without being taxed, in addition to 4,400 tonnes of rolling tobacco, and HMRC’s figures almost certainly underestimate the scale of the problem. This could be excused as collateral damage if ASH’s legislative diarrhoea led to a dramatic decline in people smoking, but it doesn’t. In its 2008 report, they set an ‘ambitious but achievable’ target of reducing the smoking rate to 11 per cent by 2015. At the time, it was 21 per cent. It has dropped by a mere 1.5 percentage points, to 19.5 per cent, in the intervening seven years despite the government capitulating to all of its demands. There are plenty of countries that achieve bigger drops than this by doing nothing at all. ASH have now reset their target and are now hoping that smoking prevalence will be 13 per cent by 2020. I, for one, am prepared to bet that it will be considerably higher than that.